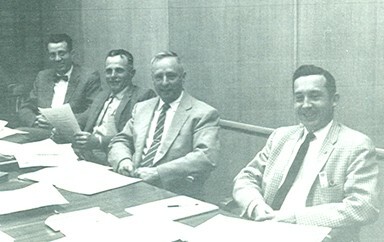 Bill Juhnke's 1961 contract with Bethel College was for a full time job as admissions counselor and sponsor of the debate team beginning in August 1961. His primary responsibility was "to recruit and counsel prospective students, also as time allows to assist the Director of Development in the general area of public relations." His salary was $5,200. Fringe benefits included a one-half tuition discount for members of the immediate family. With both Jim (senior) and Janet (sophomore) attending Bethel in 1961-62, that benefit amounted to about $600. He was allowed one month vacation, a substantial reduction from the three month vacations he had available for farm work when he was principal at Lehigh Rural High School. Bill Juhnke, Bethel College admissions counselor, received keys from Ken Stucky for a car donated to Bethel. For Bill the job at Bethel was a coming home to his alma mater where he had graduated twenty-five years earlier. His church work in the Mennonite denomination first with youth activities and later with the Mennonite Men's organization had prepared him for public relations in Bethel's Mennonite constituency. He knew most of these people personally, and he was able quickly to make family or ethnic connections with those he had not yet met. He greatly enjoyed opportunities to meet and talk with Mennonite pastors and parents, to answer their questions about Bethel College, and to encourage them to send their children to Bethel College. when Bill Juhnke was president. Edwin J. Schmidt, Albert Ediger, Juhnke, Louis Regier. It was a new experience, however, for Bill not to be the top administrator and fully in charge of operations, as he had been on the farm by Elyria and as principal at Lehigh Rural High School. At Bethel Bill's immediate supervisor, the Director of Development, was Edmund G. Miller, a pastor and administrator who shared Bill's values and preferences as a Kansas General Conference Mennonite. Ed Miller and Bill Juhnke got along well together. In 1965 Erwin Goering joined the team as Director of Public Relations. Erwin was Meta's cousin, a Swiss-Volhynian Mennonite with whom Bill was especially comfortable. 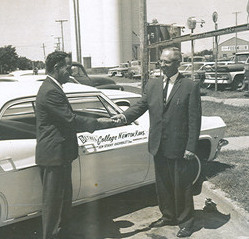 In 1965, Bill's fifth year at Bethel, Merle Bender replaced Ed Miller as Director of Development. Bender was an "Old" Mennonite with a newer more modern and rational administrative approach. He brought what one employee called "a larger view to the department," seeking to cultivate non-Mennonite constituencies, especially the business community in the town of Newton. Bethel College postcard with administration building and science hall. Bethel College in the fall of 1961 enrolled 510 students, including those attending part time. Bill Juhnke, coming onto his fiftieth birthday, was the only admissions counselor. Within a few years this would seem to be a very small and unusually elderly admissions staff. In the early 1960s, in Bethel College's mostly rural Mennonite constituency, it was quite acceptable for an admissions counselor to be more than three decades older than the students he was recruiting. But as the 1960s and 1970s unfolded, a great cultural revolution transformed the landscape of American society and the relationships of young people to the older generation. In his public relations contacts, Bill probably spent more time talking with the parents and pastors of prospective students, than with the students themselves. By the 1970s and 1980s, the family and community solidarity implied by such an arrangement seem quaint and distant. A great "generation gap" required admissions counselors closer in age to their recruits. Students, rather than parents, would make their own choices about where to attend college. And increasing competition for students would require colleges to greatly increase their youthful admissions staffs. Bill Juhnke, admissions counselor, in his office at Bethel College. Bethel College joined the trend. In 1965, Ted Drier, a 1961 graduate who had worked as a volunteer teacher in Africa and aspired to a career in public relations, joined Bill as an admissions counselor. And in 1966, Bill's final year at Bethel, Randall Krehbiel, who had graduated that spring was hired. As Ted Drier remembered nearly a half century later, Bethel had a congenial admissions team: "Your Dad, Merle and I got along great. Your Dad was supportive and encouraging. He never talked down to me. I have such great memories of him--and the fun we would have driving out to a school. He was just fun to be with." Drier acknowledged that someone in his fifties "may have seemed old then," but said that Bill Juhnke "was comfortable with any age. He was so easy to relate to. He was just good old Bill." Bill recognized that Ted might relate more easily with younger people, so he encouraged Ted to follow up with some high school students whom Bill had contacted initially. Bill was thoroughly traditional in his attitudes toward the role of Bethel College in relation to its Mennonite community base of support. The student newspaper, The Collegian (October 5, 1962), asked for his response in an opinion section to the question, "Should the Admissions Standards of Bethel be raised?" Bill opposed raising the standards, unless the mission of the college had changed. He quoted the college catalogs of 1893-1894 and of 1912 and called for continuity in the present. In 1962 the college asked for three letters of reference, one of which was to come from the pastor of the student applicant. So it should remain. Bill did not even address the issue of academic standards--high school class level or grades. In his view, personal relationships and reputation in the church community seemed most important. During Bill's first four years as admissions counselor, Bethel's enrollment remained fairly stable at around 445 students (full time equivalent). The percentage of Mennonites in the student body in those years went up from 75% (1961-2) to 86% (1964-65)--a trend that may have resulted in part from Bill's recruiting in Mennonite communities. 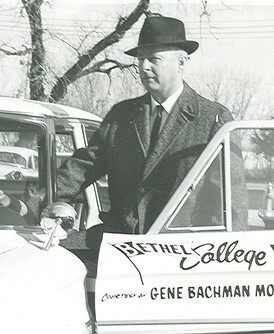 Bill's influence in recruiting students for Bethel College cannot be measured, but some Mennonite families greatly appreciated his efforts in their behalf. In 1987, at the time of Bill and Meta's fiftieth anniversary, Dan and Erma Goering wrote that they were "very appreciative" of Bill's efforts to get some scholarship money so their daughter Elvera could attend Bethel College. 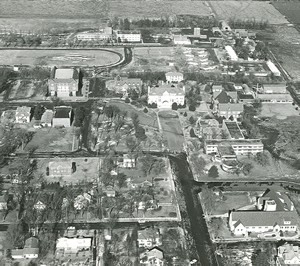 Aerial photo of Bethel College campus. 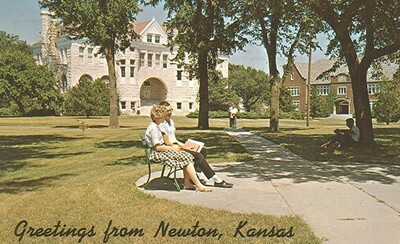 The addition of Ted Drier to the admissions staff, and more aggressive recruiting in Kansas high schools, resulted in increasing student numbers and a declining percentage of Mennonites in 1965-6 and following. The exciting campus building project in those years was a modern round-domed blond brick new Fine Arts Center, a radical architectural departure from the Elizabethan style that marked Bethel's major classroom and library buildings since the Science Hall was built in the 1920s. 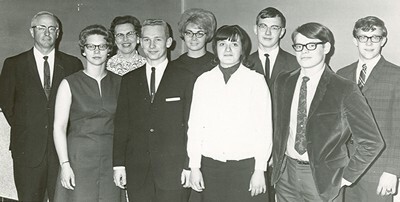 In the fall of 1961, when Bill started working at Bethel, Jim and Janet were in their fourth and second years at Bethel, respectively. Jim was student council president. Janet was in the concert choir and involved in many activities, including playing violin in the orchestra and working on the school yearbook. Bill Jr., in Moundridge High School, spent more time with the girls than Jim had at that age. He was involved in football (where he suffered a serious ACL knee injury), madrigal singers, boys quartet, and in youth activities at Eden Mennonite Church. Sharon, in eighth grade at the King City (Elyria) grade school was elected to the cheerleader squad. Ruth, too, was happy in her new school where she was in the same grade with her Elyria cousin, Marvetta Stucky. Candy at home was "quite a talker" and a rapid learner of the ABC book. And, Meta wrote, "She also does helpful things like bringing a can of sand and dumping it on the living room floor." For Meta the shift to year-round life on the farm near Elyria did not involve as many new challenges as did Bill's work at Bethel. Her work in the garden, the barnyard and the fields did increase somewhat. The number of milking cows also increased, and Meta had to take full responsibility for farm chores when Bill was on the road for Bethel. Jim, the oldest son, was not available for as much farm work as in past years. He had graduated from Bethel College in 1962, went off to graduate school 1962-3, and married Anna Kreider in August 1963. But Bill Jr., until he graduated from Bethel College and married Carita Preheim in July 1967, helped Bill Sr. with heavy farm labor. And Bill Sr. got the women of his family to help with field work as possible. After Bill Jr., was absent, Bill Sr. often hired Morris Stucky, son of Marjorie (Meta's sister) and Marvin Stucky, for farm work. getting into Bethel College car on trip to recruit students. In 1963 Bill's brother-in-law, Robert Kaufman, husband of Bill's youngest sister, Martha, asked Bill if he would be interested in purchasing eighty acres of "Juhnke" land two miles northeast of Bill and Meta's farm. Kaufman needed cash to become a partner in the John Deere agency in McPherson. Bill, who at times in earlier years had rented this land from his father and then from Kaufman, was delighted to make the purchase. His job at Bethel College helped subsidize this expansion of the farm to just over 300 acres. The eighty acre field was adjacent to a forty acre field just to the north that Bill had bought from his father. The new eighty acres had earlier been the site of the homestead of Wesley Juhnke, Bill's uncle. Remnants of the old farmstead--decrepit sheds, broken down fences, limestone foundations of the house and farm, and an old windmill--remained to be removed. Bill also had rows of Osage orange trees on the south edge and in the interior bulldozed out so that all of the available land could get into production. The environmental movement had not yet sensitized the Juhnkes to the loss of habitat for birds and small animals that came with destruction of trees. Soil conservation doctrine in those years was focused less on the benefits of trees and more on the control of soil erosion through new tillage practices and through the development of terraces, waterways and cultivation on the contour. Ever since his own high school and college years, Bill had delighted in the practice of debate and forensics. Now, as Bethel's debate coach, Bill worked at reviving the college's debate tradition. He enjoyed helping students gather information on the different public policy issues that changed each year. In the fall of 1961, the issue was "Resolved, to put labor unions under anti-trust legislation." The Bethel debate team that year had some notable success. Roger Neufeld and Gene Schmidt reached the quarterfinals in a tournament at Pittsburg State University with a 5-1 record, and won first place in a tournament at Rockhurst College in Kansas City, Missouri. In the spring of his first year at Bethel, Bill organized a debate tournament that attracted ten schools and twenty teams. Bill invited Dr. Al Meyer, Bethel's academic dean, to welcome and address the visiting debaters. "It is hoped," reported the Collegian, "that the local tournament is to become an annual event." And so it did. Bill Juhnke, Bethel debate coach, with debate and forensics students. Bill's greatest success as Bethel College debate coach came in the two school years 1963-64 and 1964-65 when his son and namesake, Willam Juhnke Jr., was a freshman and sophomore at Bethel and a star on the debate squad. Bill Jr.'s classmate, Clayton Koppes, was also an exceptionally intelligent and articulate public speaker. Bill and Clayton had an excellent year as freshmen, doing especially well at a tournament in Ames, Iowa, where they won six rounds and lost none. At the Rockhurst College tournament, Bill Jr. received a trophy for the highest individual ratings. The two debaters ended that season with thirty-four wins and ten losses. Bill Juhnke Jr. on right. The following year they broke all records. They ranked high in seven tournaments, won first at the Kansas Intercollegiate tournament in Emporia, and ended the season winning twenty-three out of twenty-six debates in their last four tournaments. The Collegian acclaimed it as "the most successful debate season in Bethel College history" (April 2, 1965). 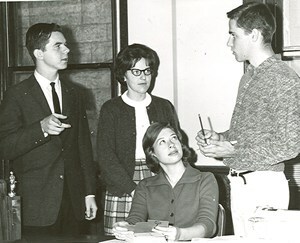 Bethel in 1964-65 also hosted a college debate tournament as well as a high school tournament, for which Clayton and Bill, Jr. served as director and assistant director. As he had when he was a high school debate coach, Bill wrote public officials asking for materials on the debate topic of the year. In August 1965, he wrote on Bethel College letterhead to Representative Garner Shriver, Senator James Pearson, and Senator Frank Carlson to thank them for sending research materials. On each letter, after his statement of thanks, Bill went on to urge these men to resist the escalation of the war in Vietnam. In a follow up letter to Pearson, (February 4, 1966), Bill wrote, "Do you, Senator Pearson, actually see how little sense it makes to call North Viet Nam aggressors when we occupy the present position in South Vietnam . . .? Mennonite relief representatives have been in Vietnam for over ten years. We know how unwelcome we . . . are there at the present moment. If you do not know this, I beg you Senator Pearson that you make it a point to discover this without delay." "The sixties are the activist years," wrote President Voth in his annual report for 1967. "Bethel students have gone to Washington to express concern about nuclear fall-out and about civil rights. They have gone to Montomery, Alabama, joining thousands of others in that march. They have had their own peace walk. They have questioned college action and policy on a host of issues. They continue to do so." Bill and Meta Juhnke supported the social and political activism of their children at Bethel. They were somewhat less pleased when their children were involved in efforts to challenge college rules--such as closing hours in the women's dormitory, or the prohibition of beer at college events. Perhaps Meta remembered her own college experience of sneaking in to the dormitory after hours. In August 1963 Bill and Meta and their family, as well as some relatives, travelled to Wadsworth, Ohio, for the marriage of their son, Jim, to Anna Kreider. Anna was a graduate student in the English department at Indiana University. That fall Jim, who had taken one year at Vanderbilt Divinity School in Nashville, Tennessee, began graduate study in the history department at Indiana University. Bill was disappointed when his contract at Bethel was not renewed in 1967. Orville Voth, Bethel's president, did not explain exactly the reason for the decision. 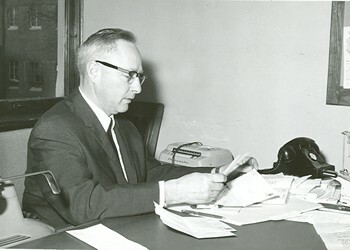 Bill sensed that one issue was the surplus of Juhnke family members at Bethel and he wrote a letter to Voth (February 3, 1967) in which he addressed the family issue. There were indeed a lot of Juhnkes at Bethel in 1966-67. Bill Jr. was in the senior class; Sharon was a freshman; and Janet, having returned to teach at Bethel after earning a Master of Arts in Teaching degree at Northwestern University, taught in the English department. Janet planned to move on to graduate study at the University of Kansas in the fall of 1967. But Bethel had also hired Anna Kreider Juhnke to teach English and Jim Juhnke to teach history, and those looked to be long term appointments. In his letter to President Voth, Bill argued that Jim and Anna were members "of their own immediate family. Their earning and income from Bethel College is completely separate from mine." It is likely that there were other issues in Bethel's decision to change admissions department personnel in 1967. It is possible that the Director of Development, Merle Bender, wanted his own team of younger admissions counselors. Bethel's administrators may have sensed that they were being short-changed by Bill's divided attention between the college in North Newton and the farm near Elyria where he lived and worked. In any case, the job of admissions counselor was not typically a long term position at colleges like Bethel. Six years may have been longer than the average length of term. So Bill and Meta in 1967 returned to the role of full time family farmers. Bill did not consider looking for a position as high school administrator such as he had held in Lehigh for eleven years. At age fifty-five he considered himself too far out of touch with school administration. He was gratified in the spring of 1968 when Howard Raid, President of Freeman Junior College, a Mennonite school in South Dakota, invited him to take a position there in public relations and admissions counseling. But Bill decided to decline the offer and to stay at home one mile east and a quarter south of Elyria. The loss of outside employment was a financial sacrifice, but the Juhnke farm land was paid for and the family was not financially stressed. Bill and Meta enjoyed farming, and there were ways to increase the farm income when they could give it their full attention. There were plenty of volunteer activities to make life meaningful in the networks of extended family, church, and local community.